Hi guys! First of all, I have to say thanks for all the love over on Instagram about my backsplash debacle. I'll write a full post on the experience soon, but you guys were all so sweet and supportive and I really appreciate it! Besides pouting about tile this weekend (ha!) I also got our living room curtains hung! 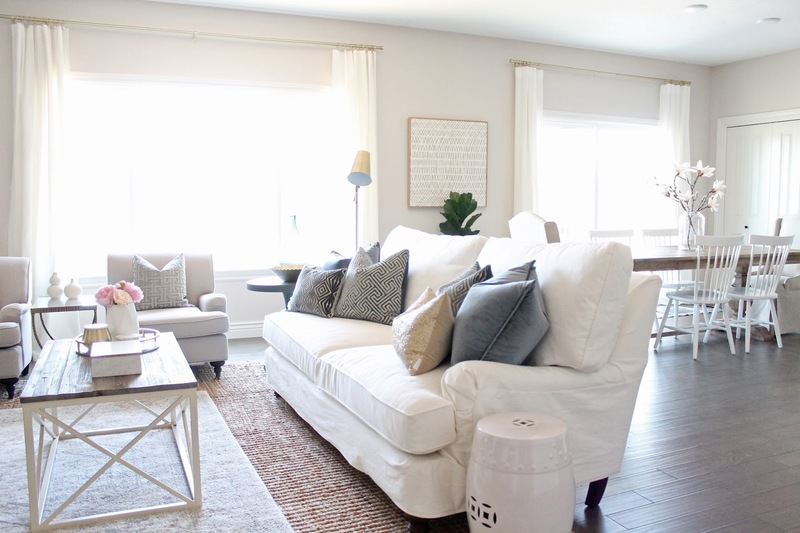 It took me a long time to decide what to do about window treatments in here because of both cost and looks. 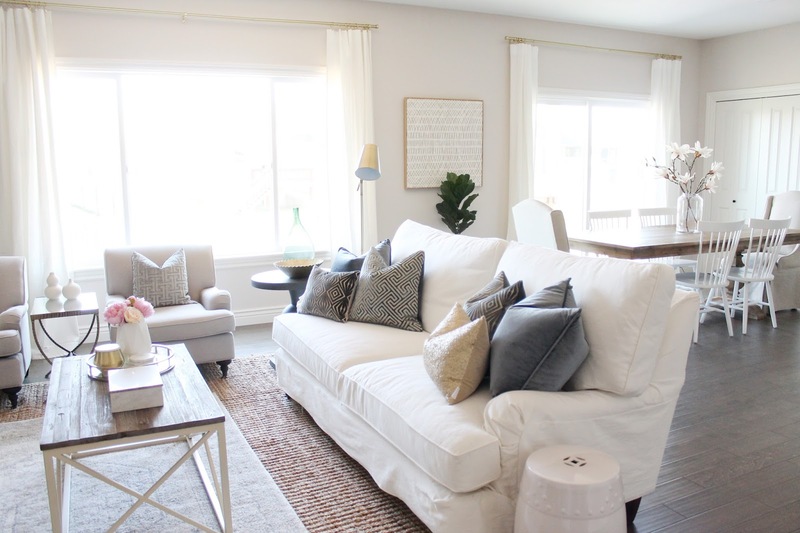 These are such large windows that I didn't want to spend a bunch, but couldn't decide whether we needed blinds/shades in addition to curtains. I also dragged my feet a bit because my favorite Target Farrah panels were perpetually sold out in the longer size. (I just went to get the link for you and they are back in stock! So the story of my life haha!) 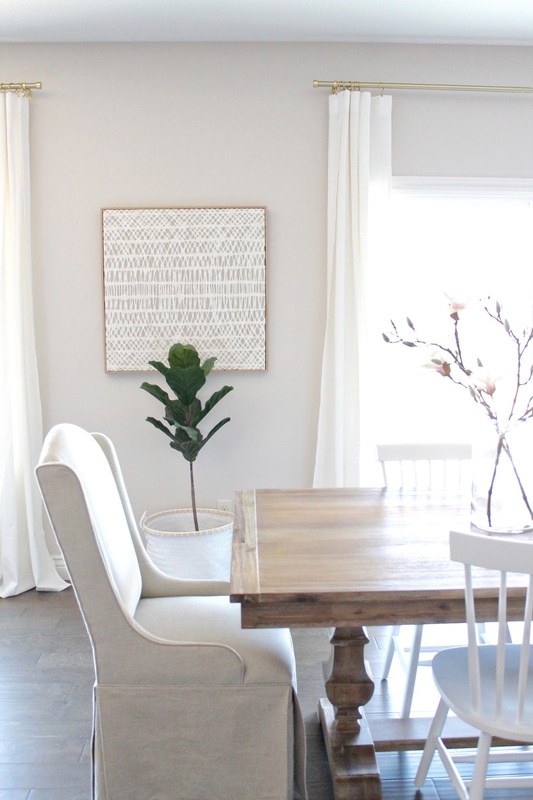 I knew the Ikea Ritva curtains were a favorite of many bloggers, but they are just a touch off-white, and I really love a true white, so was hesitant. Ultimately though, we really, really needed window coverings so I ordered two packs of Ritvas and am really happy with them. They are ever so slightly off-white but it's certainly not the end of the world. They have a nice hand to them and look much more elegant than their price point. As you can see we've made a decent amount of progress in our great room and it's really starting to feel like home! And now on to the best part...these curtain rods. They are the Umbra Cappa brushed brass rods and I love them. 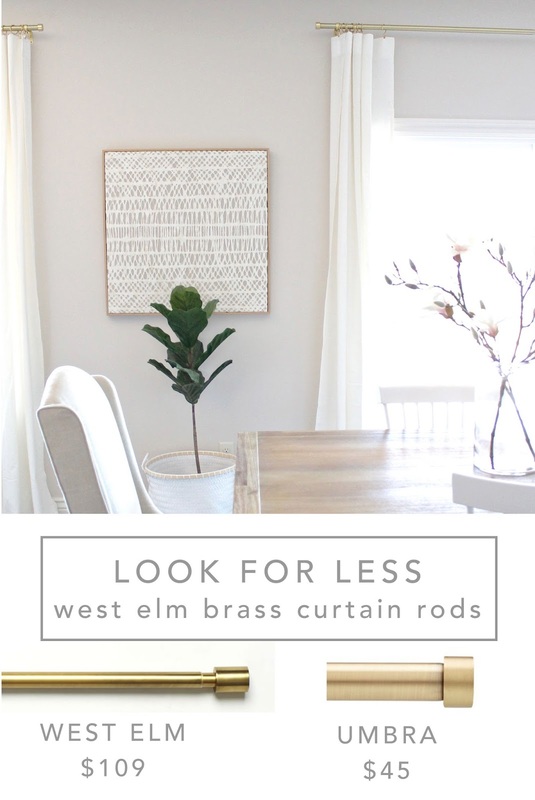 They are very similar to these from West Elm which I love but at a much better price point. The largest size (which I have) is usually between $40 and $50. You can find them on Amazon, Hayneedle, and a few other stores if you want to compare prices. I somehow got crazy lucky one night and stumbled on them for just $10 a piece! I seriously think it was a glitch in the system! I bought three rods as quickly as I possibly could in case the price went back up while I was on there. Even if you don't find them for that price, they are still a great deal. I paired them with these ring clips from Walmart.com, which were also very affordable. They are a pretty close match to the rods. The clips are probably a bit more shiny and the rods more matte. If you're very OCD it might bother you, but I think especially once hung it's hardly noticeable. 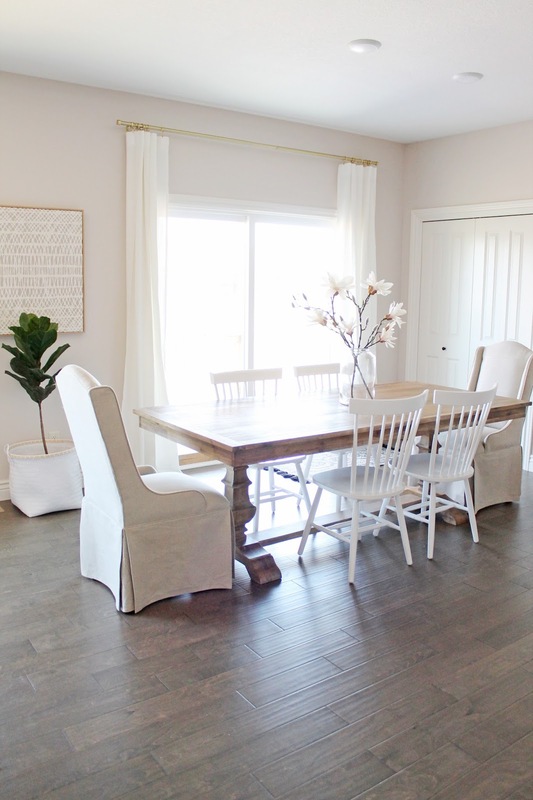 I am so happy with how our simple window treatments turned out! I'm glad I didn't end up getting other shades, since just the panels keeps things so light and simple. We can just draw the curtains closed in the evening, easy peasey. 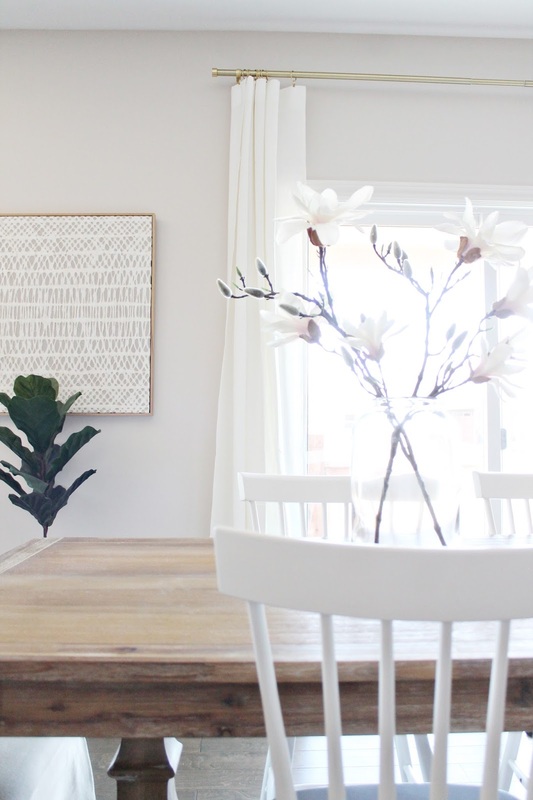 It was the perfect touch to make this room feel more complete! Hi! Can you measure how far away from the wall your curtains hang? We just bought our first house, and the previous owners left their rods, and the curtains hang really far away from the wall. Like 4 or more inches. I'm looking for a rod that hangs them a little closer to the windows. Thank you!!! 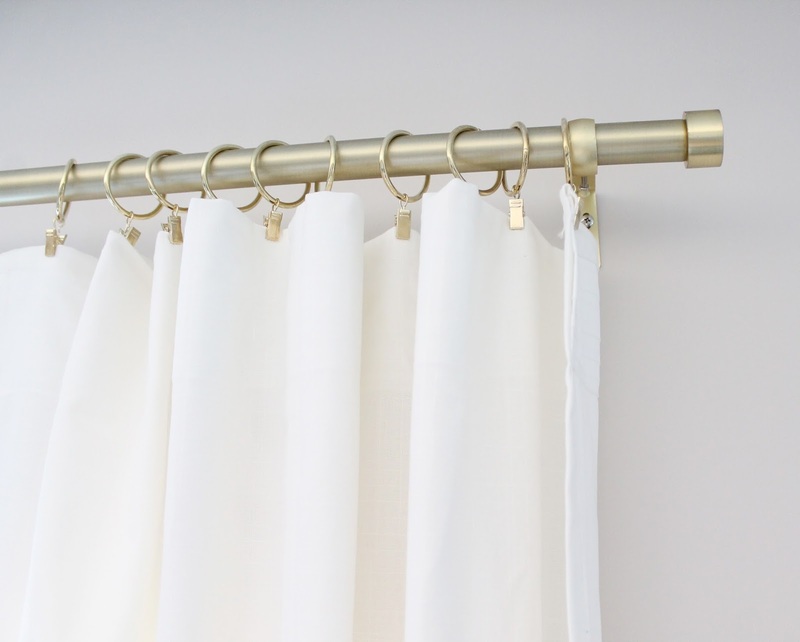 Hi, I just bought the umbra cappa curtain rods in the matte brass and need to find curtain rings to match. I am about to order the Walmart curtain rings you suggest, but want to make sure I order the right color. Which color do you have? Antique bronze or gold?